We end the season with a splash at the annual Pond Skim! Ski or snowboard over a custom built pond (costume mandatory) for a chance at a $1050 cash purse. This event always fills up for competitors and we have had upwards of 2000 spectators. Come be a part of the best end-of-season throw down around! 1:30pm all participants at the pond / checked in at registration in costume. -Pre-register online (and save $10) before 10am on the day of the event. -Maximum 60 Skimmers. You MUST wear a real costume or your entry will be refunded and we will take someone from the waiting list. -T-shirts are guaranteed to the first 50 online registrants, so sign up early! -Day of registration will be $40, and available at the Pond Skim Venue IF space remains. -Day of entries will be chosen based on best costume - at 1:30pm sharp. -Even if you pre-register you must check in at 1:30pm at the bottom of Chair 1 on the day of the event to claim your t-shirt and bag of swag! Round #1- everyone will try to skim across the pond. Those who make it across will advance to the next round. Round #2- remaining skimmers go over jump before entering the pond. Those who make it across the pond after the obstacle will advance to the next round. Round #3- remaining skimmers will enter the pond switch! Farthest skimmer is the winner. -Participants must have skis or snowboards appropriately worn (normally mounted). -Costumes are required and will be judged in a category by itself. -Skimmers must start in the order determined by the starter. 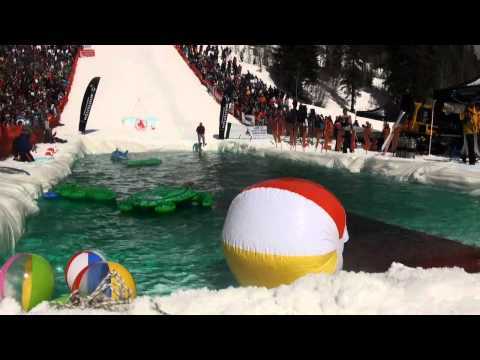 -The Pond Skim is open to all competitors 16yrs and older. -All drinks must be in a plastic container (no glass or bottles or blatant-over-the-top-drinking). -No one visibly drunk will be allowed to participate. Awards to be held at the pond 30 minutes after last skim at the pond.